I have recently visited, Dubrovnik, Croatia, and I was extremely impressed with its beauty! The best thing you can do there is visit the Dubrovnik Old Town and get lost in its streets and stairs. I would not advise going there in high season, as even now in October, low season, there were quite some tourists. I spent around 2-3 days visiting Dubrovnik and its surroundings, but you can easily stay longer there! The Dubrovnik weather is amazing, even in October, with temperatures over 20 degrees, sunny and dry weather – just perfect! Whenever you choose to go, make sure to hit the Old Town early in the morning, before 11:00 am. I arrived there at 10:00 and there were very few tourists. This allows you to pace yourself and explore quietly. If you are a solo traveller, the earlier the better! It’s much easier to take photos of yourself and take your time if there are few people roaming around. To see the Old Town, you could take a guided tour that will get you through the best and offer insightful information; or you can walk by yourself. If you are a fan of Game of Thrones, there are plenty of Gams of Thrones tours that take you through the where Games of Thrones is filmed. As I am not a complete fan of guided tours, I did some research beforehand and went around the town by myself. Early in the morning, I got my hands on the Dubrovnik 1-day card; it includes a 24h bus ticket, information booklet, city walls entrance, and a couple of museum tickets. In addition, the night before, I literally googled “Dubrovnik Old Town walking tour map” and found some excellent maps with the main attractions. I then input them in maps.me and I was ready to go! All around the Old Town are the city walls, and they are a must! If you buy a 1-day card, the ticket for the walls is included! Just show your 1-day card at any entrance of the walls and you’ll get a ticket for one entrance. 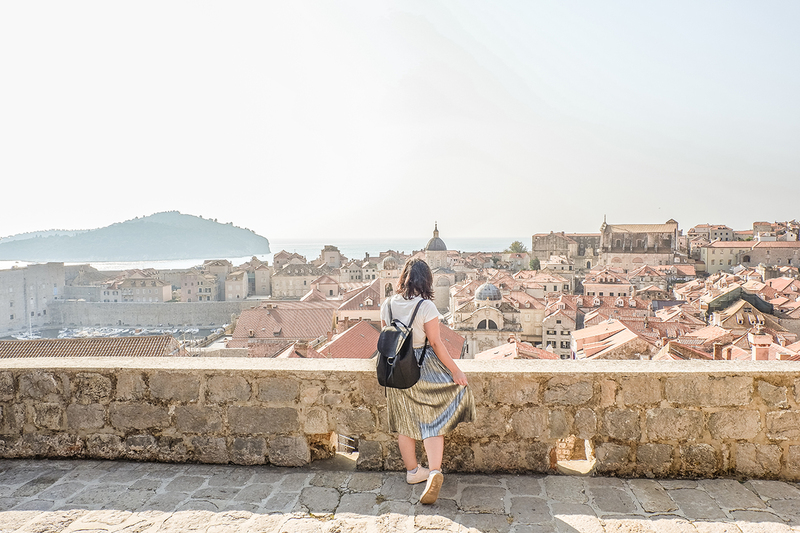 If you want to walk the all around, make sure to exit the city walls of Dubrovnik the same place you entered; if not, there are several places where you can exit earlier. If the weather is good and you are feeling energetic, I recommend walking the entire distance of the walls. You will be getting from all the corners different views of the Dubrovnik Old Town, the sea and Lokrum Island. The path can be quite narrow in some parts, but nevertheless, make sure to take your time to admire the views and take plenty of photos. I was super lucky to have pleasant sunny weather and made sure to take photos of the city (and me) as often as possible – #solotravelstruggles. I have to say that I have a love-hate relationship with cable cars. Heights make me super anxious; even though I am ok with soaking in views from the highest floors of a building. I would say that moving while being high up makes me quite anxious. But the cable car ride from Dubrovnik Old Town was quite doable! I recommend going up there before sunset, so you can see the city during the light and after the sun sets. It’s a truly magical transformation to watch, and you will not be the only one! A lot of people wait for the sunset and then flock to take tons of photos! Be aware that it’s super windy up there. Dubrovnik weather was amazing for that time of the year (late October), so on that day I had no warm clothes with me – nothing but a tshirt and a long skirt. Fair to say, I was freezing, but the view was just magical! If you are lucky, you can take extra shots in the cable car on the way down. I was the last one to go in on the way down, and being also short, I saw nothing. If you are a solo traveller, bring your selfie stick – the tripod I had did not work for this situation; There was no place to prop it so that it would catch me and the city behind. If your hotel is not within walking distance from the Old Town, the best way to check the buses going there is to check the Dubrovnik bus schedule. I would always have on my phone various bus schedules to and from Lapad, where my hotel was located. If anything, you can always ask drivers or bus tickets sellers, they are super friendly and can speak minimum English. You can buy bus tickets at the bus station, at a newsagent’s shop or inside the bus. What I loved about the buses in Dubrovnik was that they all had free wifi, so in case you want to update your loved ones, research spots to see, or download Google maps for offline use, you are safe! Croatia is beautiful! Definitely, a place I want to check out! I agreee! I cannot recommend it enough! Beautiful! I would love to go sometime! That walking tour sounds amazing! I really wish to visit Croatia one day, it has been on my bucketlist for years! Dubrovnik looks like a beautiful place to visit! How were the restaurants and food? wonderful place for families indeed! There were many with small children also! right? I was rather sad when I had to leave! These are some beautiful photos, but I imagine the pictures don’t do them justice. They are probably just as beautiful in person. The cable car looks like it might be fun. Although as I get older, I have developed a fear for heights too. Indeed, the pictures don’t do Dubrovnik justice! it’s breathtaking in real life! Dubrovnik looks like such an amazing place to visit! will make sure to do so soon! Wow! Dubrovnik old town is definitely somewhere I’d love to get lost in. The 1-day card sounds like a good deal too, and it’s a brilliant idea to do your own walking tour research. I’m also not a big fan of guided tour and much prefer to walk at my own pace. I bet it’s magical to see how the old town changes colour at sunset. Beautiful place! Dubrovnik looks like a beautiful place to visit! I really wish to visit there one day. Wow Croatia looks so beautiful! I hope I can make a trip there sometime. please do – it’s amazing! Croatia is a beautiful place. Thanks for your detailed travel diary. Shall refer to it while planning my visit. This looks amazing. This is the 1st time I am reading about this city. This is so on my list now! I am so glad! <3 hope you manage to visit it! Listen about this first time and really like your post which is so detailed about travel story. a lot of Game of Thrones fans are definitely wanting to check it out! I am happy this destination is gaining popularity! This is so beautiful! I would love to visit someday. It’s a amazing place and would definitely recommend it!